Life is about to rev up again for Gabriel Dumont. The 26-year-old forward and his Syracuse Crunch begin their AHL Calder Cup quest on the road against the St. John’s IceCaps on Friday. Life is about to rev up again for Gabriel Dumont. The 26-year-old forward and his Syracuse Crunch begin their AHL Calder Cup quest on the road against the St. John’s IceCaps on Friday. 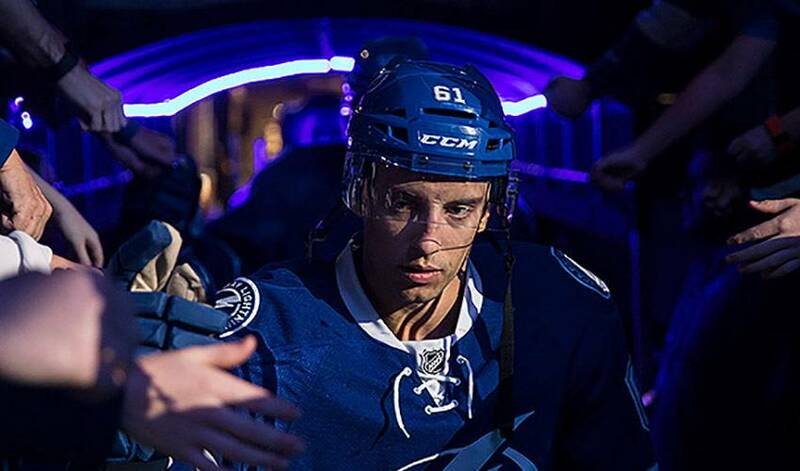 While the playoffs always are a hectic time for a player and his family, nothing compares to what Dumont went through earlier this month in a whirlwind final week with the Tampa Bay Lightning. Two weeks ago, Dumont reported to the TD Garden early for treatment for the Lightning’s game against the Boston Bruins. He was on the trainer’s table when his mobile phone rang. It was his pregnant wife Stephanie. Her water had broken. She was on the verge of giving birth to the couple’s second child. “I asked her, ‘how fast,’ and she said ‘get here now,’” Dumont said. It was about 4:45 p.m. on Tuesday, April 4. Dumont hurried off to the Logan International Airport to find a flight that would get him to Presque Isle, Maine at 9:30 p.m. He then would drive the remaining three hours to be with his wife in the hospital in their hometown of Ville de Degelis, Quebec, near the New Brunswick border. Stephanie gave birth to a healthy son Lucas at 6:30 a.m. on Wednesday morning. First-born Mateo, age two, had a brother. The proud Papa, however, had another flight to catch the next day. “[Lighting assistant general manager] Julien Brisebois called and said ‘we need you, can you get to Toronto?’” Dumont recalled. Without Dumont, the Lightning was shutout 4-0 by the Bruins. The loss was a devastating blow because Tampa Bay had gone 5-0-1 in its previous six games to close in on a playoff berth. Dumont arrived just in time in Toronto to help the Lightning beat the Maple Leafs 4-1. The next evening the Lightning visited the Montreal Canadiens to keep its playoff hopes alive. This was a special occasion for Dumont, too. He cheered for the Habs as a kid. Then, after playing a key part in the 2008-09 Drummondville Voltigeurs remarkable run to the QMJHL President’s Cup championship, the Canadiens selected Dumont in the fifth round (139th overall) in the 2009 draft. It was a dream come true for Dumont. But he would play in only 18 games over the next six seasons for Montreal. He figured it was time to move on and try to make it with another organization. That’s why he signed with the Lightning last summer. The game on Friday, April 7 was Dumont’s first game back at the Bell Centre. He played against the Canadiens in Tampa Bay the previous Saturday in a 2-1 overtime loss, but this was different because it was in Montreal. “Because of what had happened in the past three days, and that we played the night before in Toronto, and that we were in such a tight, intense chase for the playoffs, I didn’t have that much time to think about it,” he said. The Lightning defeated the Canadiens 4-2 that night and beat the Buffalo Sabres by the same score two nights later at home in the regular-season finale. But the Maple Leafs already had clinched the final playoff spot in the East. The Lightning finished one point out. As the Tampa Bay players went through their exit interviews, Dumont was placed on waivers in order to be cleared to play for the Crunch in the AHL playoffs. Even though he had established himself with the Lightning with his strong two-way play and energy in his 39-game stint this year, he was looking forward to returning to Syracuse. Dumont has not played in a postseason game since he saw action in three games for the Canadiens in the 2013 playoffs. He also has unfinished business when it comes to the Calder Cup. In 2011, Dumont and the Hamilton Bulldogs lost in the conference final in a deciding seventh game against the Houston Aeros. The Bulldogs rallied to win three straight to tie the series but lost the final game 4-3.